← Thanks. And Turkey Day. “When you embrace the struggling, you just learn how to accept it and appreciate it. For more on Mike, his diet and other videos see his site, www.thefruitarian.com. Thanks for watching! Awesome! I agree. Thanks for watching Chris. Definitely, what a great blog and informative posts, I definitely will bookmark your site.Best Regards! Thank you for sharing. What a agreat inspiration to watch. Monique @ Fork Off, Heart Disease! Big respect! Badwater is truly hard to the core. Awesome. I get quite a few comments, both negative and positive, about being a vegan runner so it’s great to see a fruitarian achieving this!! I just discovered your blog and this series yesterday thanks to No Meat Athlete and I love it! I’m sharing these videos with friends and my omnivore cyclist fiance and they love them too! I’m a vegan runner (doing my first half-marathon this Sunday) and have my heart set on one day running an ultra – but definitely NOT Badwater! Thanks for putting this series together. I’m curious what your professional opinion is of Michael’s fruitarianism? Clearly, he performs well, and has been eating that way for long enough to establish a reasonable trend of health. He’s obviously an accomplished and talented runner, not to mention a good advocate for animal product avoidance. But I have to say, no data I’ve ever seen published supports an all fruit diet – and there’s a few studies that seem to show pretty clear problems with it. I don’t mean to be a contrarian here, but I do think we need to think critically, even when it comes to people in our own camp. Hi Alex, Thanks for your comment. And I agree with you! I wrote a little about my professional opinion on raw vegan here: https://truelovehealth.com/2012/02/17/becoming-raw/ In short: It can be beneficial but personally don’t see enough of a benefit to eliminate healthy whole-foods like lentils, quinoa, etc. Thanks for stopping by! Wow! 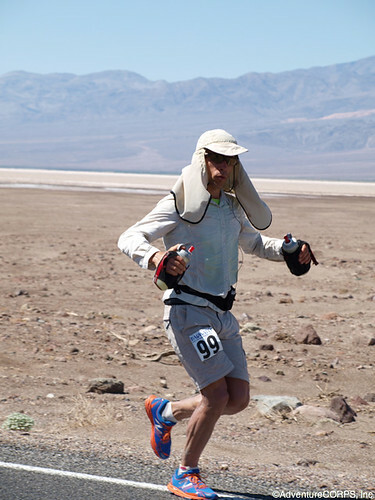 I’ve always loved Mike Arnstein, but this video really shows the pain of the Badwater. As a raw vegan runner myself, this is truly inspiring. Thanks for the video Matt! Soooo inspirational!! I’m not a runner but have embarked on an endurance race of my own. I’ve lost 135 pounds with 150 pounds more to lose. You have shown me that whatever goal we might have, NEVER give up! Congrats to you and thanks so much! Matt – what you are doing here is incredibly inspiring. You are clearly doing what you love and are really enjoying it. As a vegan endurance athlete, I love the videos, but what I enjoy the most is seeing someone doing what they are meant to be doing. Keep it up, man – you are a true inspiration!